After the student killing in the parking lot, City Councilman Bill Rosendahl called on the city to spend more money for youth programs and anti-gang efforts in the Venice community, which is home to two street gangs, the Venice 13 and the Venice Shoreline Crips. The bus shelters are erected and maintained by CBS/Decaux, a joint venture of CBS Outdoor and JC Decaux, the latter Europe’s largest purveyor of outdoor advertising. In 2001 the city entered into a 20 year contract with the company to provide bus shelters, automated public toilets, kiosks and other forms of “street furniture” in exchange for a total of $150 million in revenue. 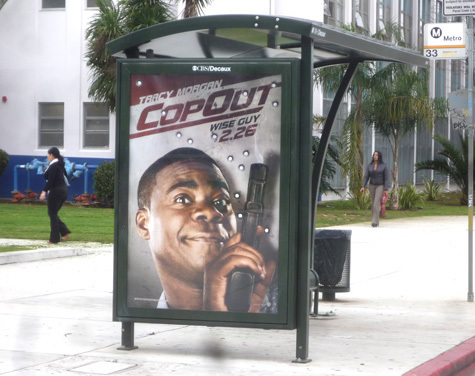 In England, complaints have often been raised in recent years about the “glamorization” of guns and violence by movie ads. In 2008, the country’s Advertising Standards Authority directed the removal of outdoor ads and posters for the movie “Wanted’ that showed actress Angelina Jolie brandishing a pistol.